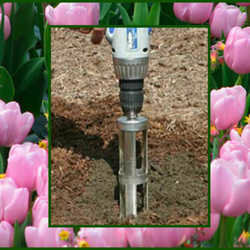 Growing up in my household, each fall we added more tulips and daffodils to our property, and for this purpose my mom had bought a huge drill bit for our drill and would dig holes. This was vastly superior than other digging methods, but the soil would gum up into the drill bit, it was a hard job to get the soil out of the spiral grooves, and it destroyed the grass. This Bulb Bopper has the same concept but being circular instead of spiral shaped, it doesn't suffer from any of those weaknesses. You just jam a stick down the center and the dug soil comes right out. Additionally, the bulb bopper pops a grass plug completely intact out of the soil. So installing bulbs in a grassy area doesn't disturb the lawn; in fact you hardly notice that anyone was there installing bulbs. The only limitation I found was that it requires a typical drill. It would be much better if the connector would also be made to fit into a cordless impact driver. Maybe the company could offer an add-on that would enable it to be used with an impact driver. That would be nice. I gave it 4 stars instead of 5 only because of this limitation - I just love my impact driver and am sorry I couldn't use it instead of the weaker drill. 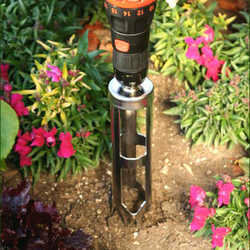 This is an excellent tool and should be in every bulb lovers toolbox. Great timesaver! !